FRENCH ONION DIP is a classic appetizer that should be present at every party. 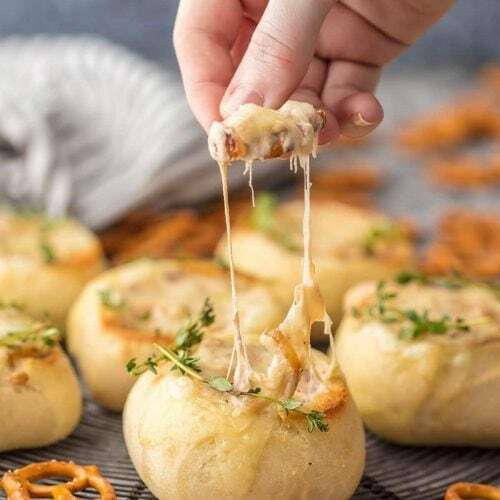 We made this dip even more fun by making it in mini bread bowls! Making bread bowls with fresh rolls is easy, and it makes the perfect appetizer for the Super Bowl. Carefully cut the top of each roll off, about 1/2 inch down from the top. Leaving a 1/2 inch border, hollow out each roll, saving the inside and cutting into cubes. You can also cut the top of each roll into cubes. Lay the rolls on a large baking sheet as well as the cubed insides. Spray with olive oil spray or drizzle with olive oil and set aside. Add the broth and wine to the onions and stir to combine. As soon as its all simmering, reduce the heat to low. Stir in cream cheese, sour cream, mozzarella, and salt and pepper. Remove from the heat. Spoon the onion dip mixture into each bread bowl, about 2 tablespoons per roll. The dip should be just slightly higher than the top of the opening. Bake uncovered for 5-6 minutes. Remove from the oven and place half a slice of swiss over the top of each bread bowl. Return to the oven and switch to broil. Broil for 2-3 minutes or until the swiss is bubbly and the bread is slightly browned/crisp. Serve immediately with the toasted bread cubes and extra pretzels for dipping.